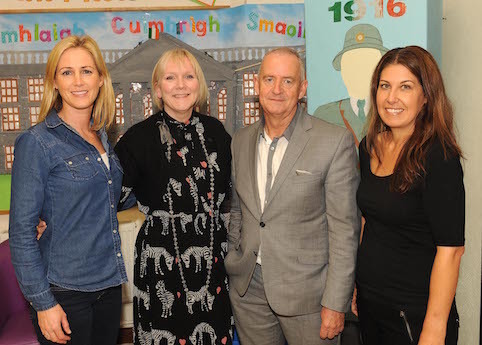 We have a long tradition of making parents welcome at Gaelscoil Faithleann and a great tradition of our parents helping and contributing to our school. Open communication is encouraged among the school community. 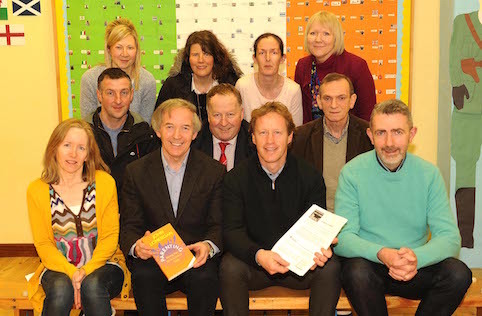 An active and dynamic Parents Council has been in existence at the school since it was founded in 1989, affiliated to The National Parents Council of Ireland. They are a very positive influence in our school. The Parents help us each year with our Sports Day. They organise coffee mornings from time to time for the school and for charity. We received a defibrillator from Our Parents Council in 2010. Irish Classes are organised by our parents each year, two classes take place, one for beginners and another for more advanced learners who are involved in a “ ciorcal cainte”. School policies are circulated to all parents and feedback and suggestions are made at Parents Council Meetings on these policies. The Parents help with gardening, clearing the school woodland of rhododendron etc. A Communion party has been organised by our parents for the past twenty six years at the school. Each year Daidí na Nollag is organised to visit our school at Christmas. He comes in varying modes of transport ,and in 2008, even landed in a helicopter. A photo from this visit made the front page of The Irish Times. Every child is given a gift by him. The parents organise a second hand school uniform box in the school hall where families can donate uniforms that are not being used. These are discreetly sold on to other families in the school. 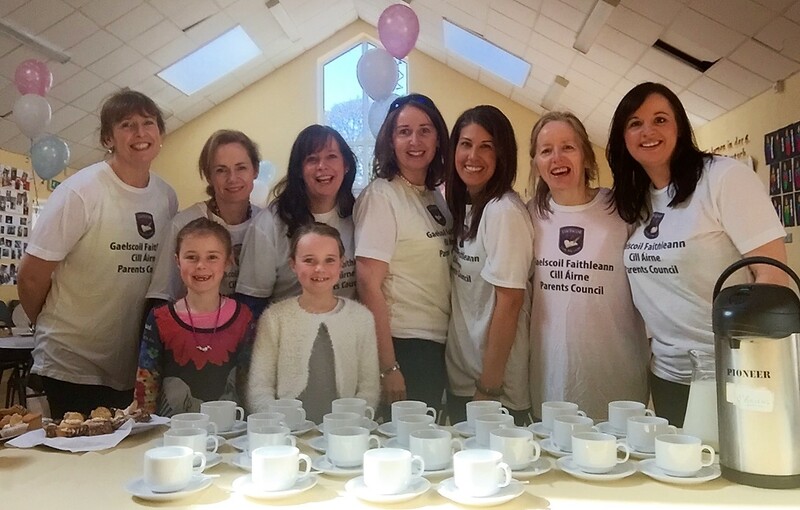 In June each year the they organise refreshments at our induction day for the parents of our new naíonain bheaga .They also speak to the new parents about the work of The Parents Council in the school. They pay for Yoga classes for all of the children in the school. Each class group has 6 classes of yoga paid for by our parents council. The organise guest speakers to the school and recent speakers include Dr. Fergus Heffernan and John Lonergan. 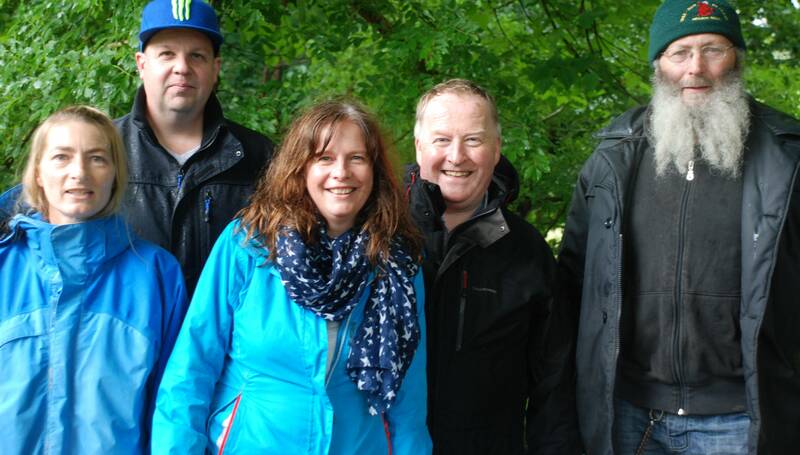 Fundraising is important for every school, and our parents have collected an admirable amount of money for our building fund down through the years , through sponsored walks, church gate collections, etc. Among the other activities that they organise are; home baking for visitors, cake sales, helping on the green schools and health promoting schools committees, face painting on special days ,organising talks for parents on substance abuse etc. We are sincerely thankful for the support our parents give us. Bíonn fáilte roimh thuismitheoirí i gcόnaí sa scoil . Tá coiste na dtusimitheoirí againn ό bhunaíodh an scoil i 1989 agus iad cláraithe leis an” National Parents Council of Ireland”. Tá tradisiún láidir againn de cabhair a fháil ό thuismitheoirí scoile sa scoil seo againne. Bailíonn siad airgead don scoil le haghaidh rudaí ar leith; na seomraí ranga nua, fearas agus rl., Tá méid mόr bailithe acu le blianta anuas. Cabhraíonn siad leis an lá spόirt. Eagraíonn siad ranganna Gaeilge do thuismitheoirí, ceann amháin le haghaidh daoine le beagán Gaeilge acu agus tá ciorcal cainte acu leis. Cuirtear polasaithe amach go dtí gach tuismitheoir agus faigheann an príomhoide tuairimí arais mar gheall ar na polasaithe seo. Cabhraíonn siad linn nuair a bhíonn tubaist againn. Cabhraíonn siad nuair a bhíonn garraíodόireacht agus rl ar siúl agus nuair a bhíonn meitheal uainn. Eagraíonn siad féasta sa scoil ar lá an Chéad Chomaoineach, seo tradisiún atá sa scoil le 20 bliain anuas. Eagraíonn siad Daidí na Nollag don scoil gach Nollaig, Faigheann gach dalta rud ar an lá seo is cuma cén rang ina bhfuil siad, Bíonn seifteanna difriúla acu gach bliain chun Daidí na Nollag a thόgaint ar scoil, bliain amháin tháinig sé i heileacaptar agus bhí grianghraf den όcáid ar an gcéad leathanach den Irish Times ( 2008). Tá bosca acu sa halla a úsáidtear chun sean éadaí scoile a bhailiú agus iad a dhíol le daoine gan mόrán airgead acu sa scoil i slí príombhaideach. Tá rudaí difriúla eile déanta acu le blianta anuas, cainteanna mar gheall ar dhrugaí do thuismitheoirí, bácáil le h-aghaidh cuairteoirí, ag cabhrú le scoileanna cothaithe sláinte agus rl.